If you've read a book recently that you'd like to recommend to other readers, send your review to nancy@ottobookstore.com. We reserve the right to edit for space, clarity, and content. 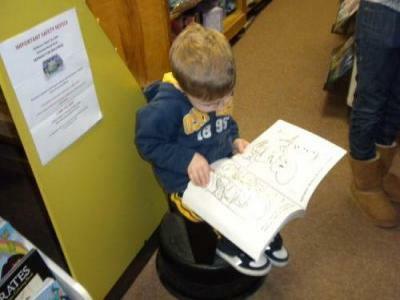 Liam, from Pittsburgh, has found a good book and a comfy seat. You can too. Come see us soon, and share a favorite book. This book was about Morgan, Rusty, and Grandpa Allen trying to protect the medallion from the forty thieves. The medallion is a necklace you put on when you want to change into an animal. The forty thieves are the people who try to capture the medallion. My favorite part of the book was when Rusty and Morgan rescue Grandpa Allen from the forty thieves. I didn't dislike any part of the book. I would recommend this book to my friends because they would like learning about the medallion and the powers you can have. The name of the book is A DROP OF HOPE by Keith Calabrese. The book is about how Rollo's birthday presents help people. A toy becomes friends with Tommy and Wiston. I liked the book because of the adventure that Ernest, Lizzy, and Ryan have. I would recommend this book to my friends because they will probably like what fun things the kids do in the book. This book is adventurous and emotional because the polar bear cubs (First and Second) have a hard mission and want to save their mom from the Timekeepers who want to harm all cubs from Bear Kingdom. I think some people would be sensitive to some character actions and language used. It is all good at the end when they find a relative to help them in their mission. This is a very fantastic and funny book. Mr Popper is coming home from painting a house and it's almost winter. He gets a present from Admiral Drake! Soon it becomes very ill, or is it?! He gets 11 more penguins! This is a very interesting book. I think this book should be for 2nd graders and up. THE MYSTERIOUS BENEDICT SOCIETY Wants You! STICK AND STONE Stand up and Rock for Friendship! THINGS THE GRANDCHILDREN SHOULD KNOW.